Primary treatment involves the physical separation of suspended solids in the form of fat, oil, grease, and other biological pollutants leading to the reduction of biological oxygen demand (BOD) from a waste stream. 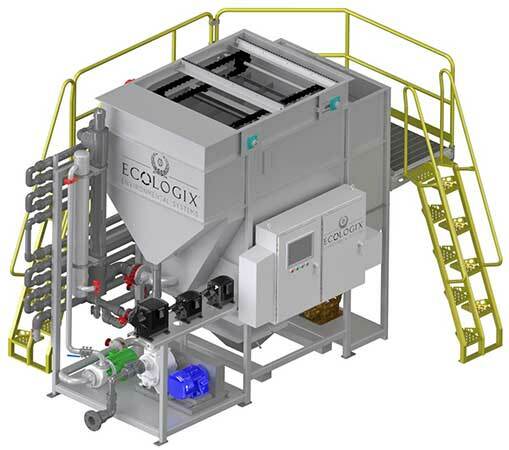 Ecologix offers a unique line up of primary treatment products suitable for any industry or environment. Our cutting-edge technologies and vast experience ensure you receive the solution that best suits your project needs.. See our products below, or call us for assistance in selecting the primary treatment solution fit for your project needs. Developed especially for Oil & Gas fracking operations, the ITS system treats Flow Back and Produced Water to reuse standards. Even with the recent oil price slump, the need to treat high volumes of Produced Water from oil wells will remain a constant necessity. Recent regulations in places like Pennsylvania, Oklahoma and Canada are making the need for recycled water a reality for this industry. 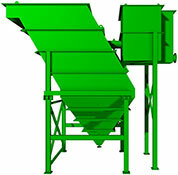 This inclined plate clarifier is most suitable for applications requiring settling of solids and is commonly used in industries such as Automotive, Die Cast and Mining. It comes equipped with a flash and floc mix tank prior to the clarifier zone. Its high internal surface area results in a small footprint. The Ecologix Emerald (E) Series DAF is a complete primary (phys/chem) treatment system. It is an incredibly versatile and efficient combined chemical precipitation and physical separation system. The Emerald DAF combines several proven technologies such as DAF (Dissolved Air Flotation), ACE (Air Charged Entrainment) and DGF (Dissolved Gas Flotation), into a single platform.